Mumbai, April 5 (IANS) Singer-actor Diljit Dosanjh has collaborated with YouTube sensation Lilly Singh for a comical video, showing what happens when two Punjabis meet each other. Lilly, popularly known as Superwoman, on Friday took to Instagram to share the video with her followers. "When you meet someone from the motherland... This is definitely how Punjabis greet each other, complete with a five-minute long hand holding session and family tree check-in. To be honest, Diljit and I aren't even acting... someone was just rolling when we met up," she wrote. In the video, Lilly can be seen formally shaking hands with the foreigners, but when she sees Diljit, she gets carried away and starts talking to him in Punjabi. From asking about each others' health to relatives, Diljit and Lilly engage in a funny Punjabi conversation. 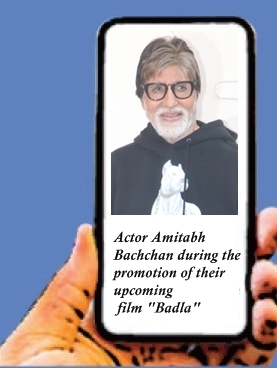 The video clip has generated a lot of love from social media users, including memebers of the Indian film and television industry. After watching the collaboration, actress Zareen Khan commented: "I love Punjabis." Actor-anchor Maniesh Paul wrote: "So True." The "Do you know" hitmaker also shared the video, captioning "Toronto Di Lilly Te DosanjhanWala... When Two Punjabis meet." Lilly was in India for the YouTube FanFest held here recently.